Depending on your industry, location, and resources there are dozens of ways to market your business both on and off the internet. To many, the Internet is a very attractive marketing tool because the barrier to entry is often lower than offline marketing methods, such as postcards, flyers, billboards, etc. But, the problem with marketing your business online is that there are so many different options. How do you know where to get started with your internet marketing? Ask yourself this question. When you are looking for something information, where do you go to look for it first. I don’t know about you, but I Google darned near everything! Whether I need directions or I’m trying to get the scoop on a company before I do business with them, I search. Apparently, I’m not alone. 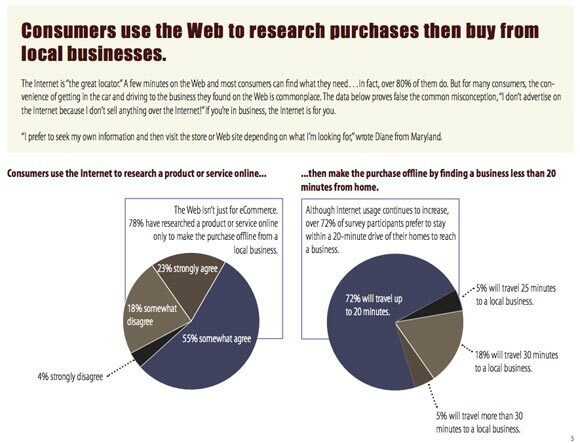 In a study done by WebVisible and Nielsen, it was found that 78% of consumers have researched a product or service online with the intent of purchasing locally and that 72% of consumers will travel up to 20 minutes to get that product. There is a screenshot of the study findings below. Now that we’ve determined how important local search is, let’s talk about how your company can take advantage of local SEO! A typical search engine page usually has a mixture of paid listings, local listings, and organic search results. Being a local business allows you to get into these local listings, above 100’s of thousands of other results! 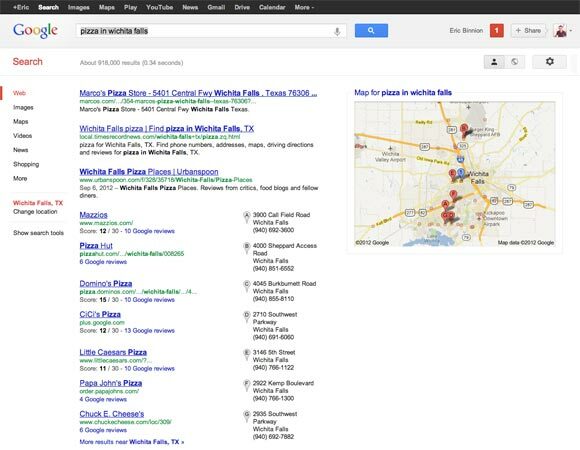 Below is a search result for “pizza in Wichita Falls”. Looking at these results, you’ll notice that there are local search results starting at the 4th listing. Also notice the map to the side that contains all of the local listings. Being anywhere in the local listings on the first page puts you in a very good position. Registering your local business with the search engines is free and relatively simple. You will need to go to the registration page for each search engine, fill out a form, follow the verification directions, and then your company could show up in the local listings. Include pictures with your local listing. Ask for customers to give a review of your business on your local listing or major sites such as Yelp. Add a local phone number on your website. Have a full address on all page of your website. The footer works fine for this. There are many more ways that you can optimize your listing for local SEO. I’d like to forward you to a great article that Rand Fishkin wrote on SEOmoz about a tactic for better rankings in Google local. Well nowadays everything is attached to some online services even the local business who knows the potential market of customers online, so it’s always a good idea to keep yourself updated in the different local listings so that you can get the most out of it. In this competitive era one must not ignore the potential of online customers and value of SEO. Many local businesses don’t understand the importance of blogging and social media that can help them even further with local SEO. I think half the battle is not so much that they don’t have time, but getting them to understand what they can come up with for content and that what they have to say is actually important.